YOUR PET IS HAVING AN ANAESTHETIC: WHAT SHOULD YOU EXPECT? Our dogs and cats bring us endless amounts of joy. Whilst we would love for them never to get ill, most pets will need to have surgery involving general anaesthetic at least once in their lifetime. This can be worrying for any pet owner, especially if they’re not aware of what to expect. At the Insurance Emporium, we want every day you spend with your pet to be a magical adventure, and above all stress free, so we’ve spoken to our pet health expert to find out more about pet anaesthesia. 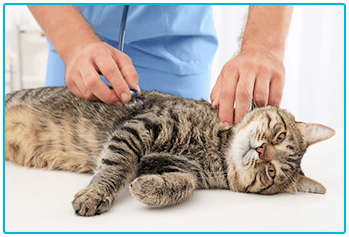 Your vet will usually ask that your cat or dog fasts from the night before their treatment. This is to make sure they don’t have any food in their bellies, and they won’t bring anything back up whilst under anaesthetic. However they should be able to have water until the morning of the operation. As every cat owner knows, felines are natural hunters, so keep them inside during this time to make sure they don’t find themselves any extra snacks! Dog owners should also let their dog outside to toilet that morning. If your pet is taking regular medication, make sure to check with your vet that they can take it, as usual, on the morning of the appointment. Your vet will ensure that your cat or dog is able to have the anaesthetic by going through their medical and vaccination history. This will include any pre-existing conditions and medications they may be taking. Your pet will also have a physical check to assess any potential risk and the vet may recommend a blood test or blood pressure check. 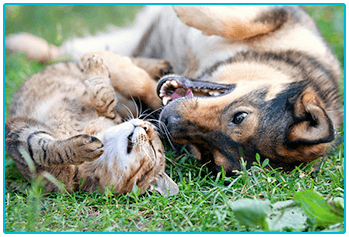 Consider any particular needs your dog or cat might have during the process. For example, does your pet have any behavioural issues? The way the operation is performed could be adapted to suit individual animals. Also, if your pet has a favourite toy or blanket, you might bring these along — the familiar scent of home could provide some comfort to them. As we all know, there is always paperwork involved in getting anything done! Before general anaesthetic can be administered to your pet, you will need to sign a consent form. This will tell you about any key points to do with the surgery and might also include payment terms. If you have any questions at all, make sure to ask them at this point. A vet or nurse should be on hand to provide any answers. Before the anaesthetic is given, your dog or cat will be injected with a pre-anaesthetic medication, which will normally include a sedative and pain relief. Once this takes effect, an intravenous catheter will be used to administer the anaesthetic. This will put them to sleep so that they are completely unaware of what is happening, and ensure they will feel no pain at all. 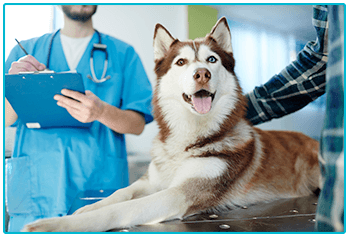 During the procedure, your dog or cat’s heart and respiration rates, temperature, oxygen and carbon dioxide levels will be closely monitored. If needed, intravenous fluid therapy may be given before or during surgery. This involves an endotracheal tube being placed down their airway. In this case, they would also be placed on oxygen and the anaesthetic would then be inhaled. For routine procedures, your pet will normally be ready to go home on the same day. The vet will assess your pet when they are awake and arrange a discharge appointment so that you can take them back home to rest. You’ll be given instructions outlining any signs to look out for, how to care for your pet whilst they recover, as well as instructions for any medication they might need. You’ll notice a clipped patch of fur on your dog or cat’s leg — this is the site where the anaesthetic was administered. By the next day, your pet should be back to their usual self, although they will probably feel a bit sore around the surgical sites! Nevertheless, you will soon be able to continue your magical adventures together. Knowing what to expect when your pet is having a general anaesthetic can help put your mind at rest. Even so, if you want any more information, be sure to speak to your vet.